Roger Federer eased to a 6-3 7-5 6-4 win over Brazilian Thiago Alves to book his place in the US Open third round. It was the defending champion's 29th straight win in New York. Third seed Novak Djokovic was given a decent test by American Robert Kendrick before coming through 7-6 (10-8) 6-4 6-4 at Flushing Meadows. Former champion Andy Roddick also made it through, but the eighth seed had to fight hard for his 3-6 7-5 6-2 7-5 win over Latvian Ernests Gulbis. Federer was never at his best against Alves, committing 46 unforced errors and converting only four of his 15 break points. The Brazilian shocked Federer - and the crowd - by breaking for the first time in the match to draw level at 3-3 in the third set. But the world number two found his form at 4-4 to break once more before effortlessly serving out victory. What did you make of Federer's performance? 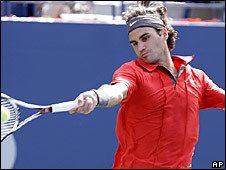 Federer, seeking his fifth straight title at Flushing Meadows, said he was pleased with his form. "I was never really in danger, so it was actually pretty good for me," he said. "I knew the longer the match would go the more tired he would get, so it was a good match for me. "I served really well which is a big bonus." Federer will face 28th seed Radek Stepanek in the third round after the Czech player beat unseeded Australian Chris Guccione 6-4 6-4 6-7 (3-7) 6-2. Djokovic booked a meeting with rising Croatian star Marin Cilic after seeing off big-hitting American Kendrick. In an absorbing first-set tiebreak, Kendrick roared back from 6-2 down before earning two sets points of his own. But Australian Open champion Djokovic saved his best for the crucial moments and eventually came through in straight sets. "When I need to step it up, that's what I do," said the world number three. "For me it was very important mentally to survive that first set, when I was 6-2 and he came back and had set point and the serve. "It could go either way. But these tough matches make you stronger mentally so you can use that experience for the future." Roddick, who turned 26 on Saturday, admitted he had struggled early on against Gulbis, who was also celebrating his birthday. "He was definitely out-playing me for the first two sets," said Roddick. "I felt like a little kid out here playing against him. Then the clock struck 12 and I felt a lot better playing out here as a 26-year-old." The hard-serving Gulbis, who is six years younger, hammered 19 aces to Roddick's 21, but he had nine double faults and made 56 unforced errors to Roddick's 42 unforced errors. Roddick, whose lone Grand Slam title came at Flushing Meadows in 2003, will now play the unseeded Andreas Seppi of Italy. Elsewhere, fifth seed Nikolay Davydenko kept up his serene progress in New York with a 6-4 6-4 7-6 win over Argentine Agustin Calleri. Davydenko will now meet fellow Russian Dmitry Tursunov . In the same quarter of the draw, Luxembourg's Gilles Muller caused a surprise by recovering from two sets down to beat Tommy Haas. Qualifier Muller reached the third round of a Grand Slam for only the second time his career - and the first time in New York - after a 2-6 2-6 7-6 (7-5) 6-3 6-3 win. Spain's Tommy Robredo will face France's Jo-Wilfried Tsonga in the third round after he ended the hopes of 2000 champion Marat Safin with a 4-6 7-6 (7-4) 6-4 6-0 win. Australian Open finalist Tsonga, playing his first tournament since May following a lay-off with a knee injury, fought back to beat Carlos Moya 4-6 6-3 6-4 6-4. Fernando Gonzalez survived an injury scare before getting the better of American Bobby Reynolds. The Chilean, seeded 11th, needed treatment after turning his ankle in his 7-6 (8-6) 6-4 6-4 win. Gonzalez meets Finland's Jarkko Nieminen in the last 32.